Sign up for Audrey's Mailing List! I can hardly believe it is November already! Where has the time gone? We’ve been so busy that it feels as though it was just summer, and soon enough the holidays will be here. We had so much fun over Hallowe’en. I love seeing the kids in their costumes as they are so excited for the night! You could say many Halloween traditions actually originated in Scotland, with the ancient Celtic festival of Samhain, or summer’s end -- the end of summer, or the world of the living, and the beginning of the cold winter, the world of the dead. The Celts believed that once night hit on October 31st, ghosts of the dead walked once more, and so they would light bonfires to ward off the evil spirits. Children would dress up to “blend in” with the spirits, and would receive offerings when they arrived at a house. 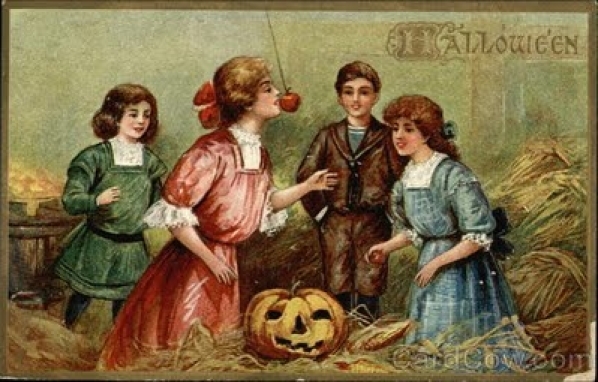 Today, trick-or-treating is more common, although children also perform for those at the door. In Scotland, they used to make lanterns out of turnips, cutting through the skin to create eyes, nose, and a mouth. Now, pumpkins are used instead due to the influence of American culture. I have a couple of book recommendations for you today as I continue to work on Peggy’s story (which is coming, I promise) -- enjoy!